During the 1880s a charity was founded in the east end of London by the Reverend Michael Paget Baxter, proprietor of the Christian Herald Newspaper, together with his wife. 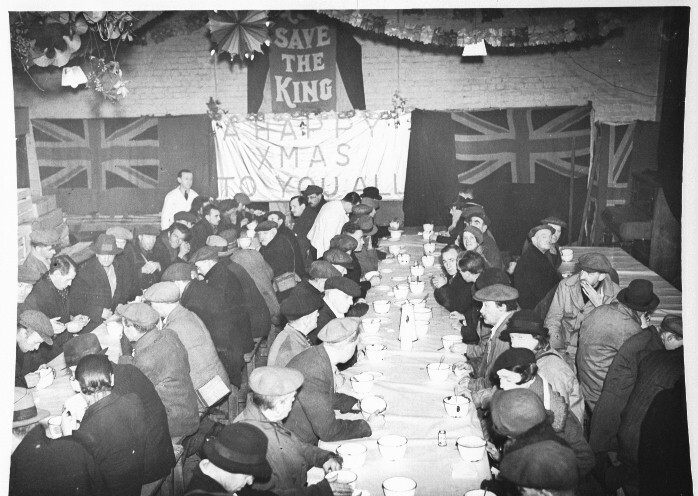 Initially the charity was established to provide sustenance to people suffering from hunger; however, this work soon increased and the charity began supporting impoverished people with a range of needs – gifts of clothing were made and accommodation was provided for stranded women and girls. 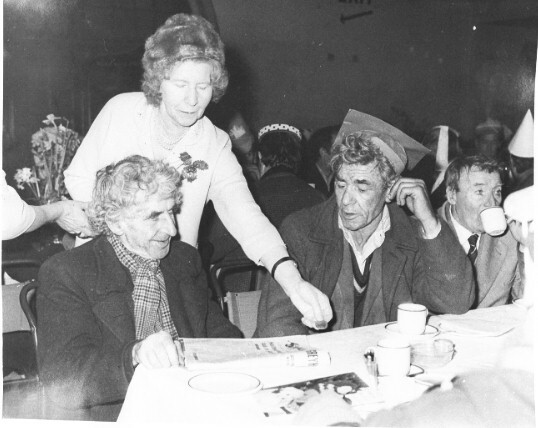 Over time the founders’ granddaughter, Miss Violet Elizabeth (Betty) Paget Baxter, became very involved in the charity and developed the Willow Street Philanthropic Mission – offering desperately needed support to the poor and needy. Over time the mission acquired a property which was used as a hostel specifically for the support of vulnerable women in the centre of the city, known as the Elizabeth Baxter Hostel. 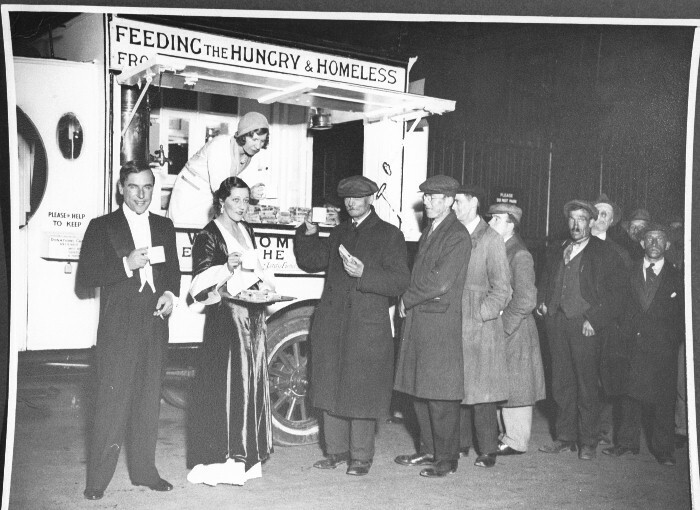 Around 1905, a travelling van was developed with the aim of providing hot food and drink to homeless and vulnerable people on London’s embankment. However, early in the 1920s the van used by the charity was under threat of being summoned to Court for causing an obstruction whilst the vehicle was stationary. In order to get around this piece of legislation and enable the van to continue providing its much needed service, the van had to be operated whilst mobile – no easy feat. A special gearbox was fitted in 1927 so the vehicle could keep moving at only a quarter of a mile an hour, distributing food to the poor whilst on the move. How times changed. With the coming of the Second World War, the very police who had invited the van to ‘keep moving’ were more than happy to see it stop and service them with their cups of tea and other refreshments. 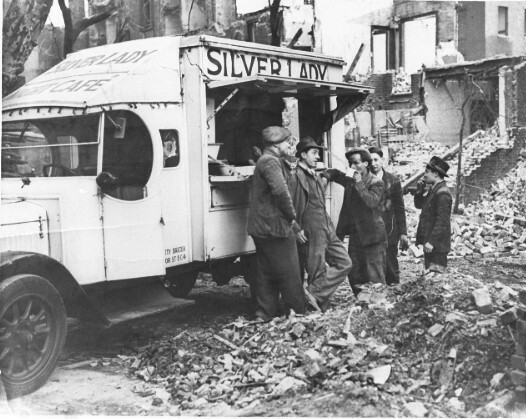 Amazingly, the van suffered no damage despite operating daily throughout The Blitz. Miss Baxter’s passion for addressing homelessness in London had also brought her to the attention of none other than the famous playwright George Bernard Shaw. In order to dissuade young men, women and children from travelling to London in search of work that did not exist, or that had been falsely advertised by white slavers, Miss Baxter commissioned a film to be made. Titled ‘The Night Watch’, the film was a warning against homelessness and the white slave trade, the effects of which were so noticeable on the embankment. The film was refused a licence by the Censor on the grounds that ‘…domestic servants were badly wanted in London, and that the film might discourage girls from coming to help London out of that difficulty.’ Not easily disheartened, Miss Baxter approached George Bernard Shaw who took up her case, writing a letter to The Times when she was unable to resolve the matter herself. The full letter can be read here. 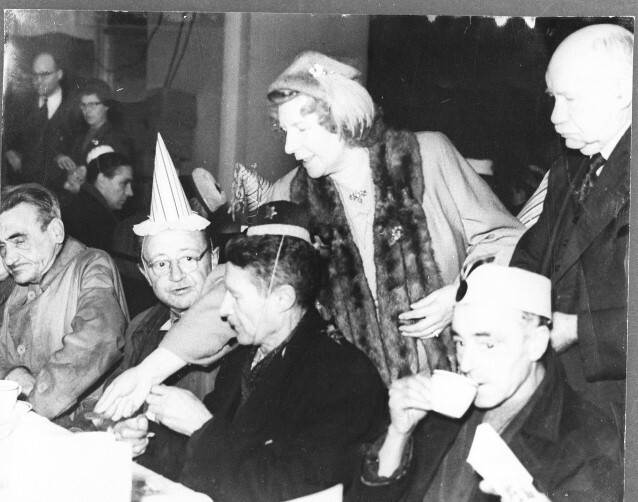 Sadly the film was never granted a licence, however Miss Baxter continued working to improve the quality of life for those in need, perhaps most poignantly through her annual Christmas meal which offered an opportunity for those who were homeless to celebrate together under a warm roof. Towards the end of the 1920s and in the 1930s, the Baxter family lived in Tudor Street and it was a common sight for people who were in need to call at the premises to see whether Miss Baxter had left any sixpenny or one shilling pieces for them to collect off the railings. These actions together with the colour of Miss Baxter’s hair led her to be known as the Silver Lady, and when the two functions of the hostel and the mobile service split the hostel remained known as the Elizabeth Baxter Hostel, and the travelling van became known as The Silver Lady Fund. 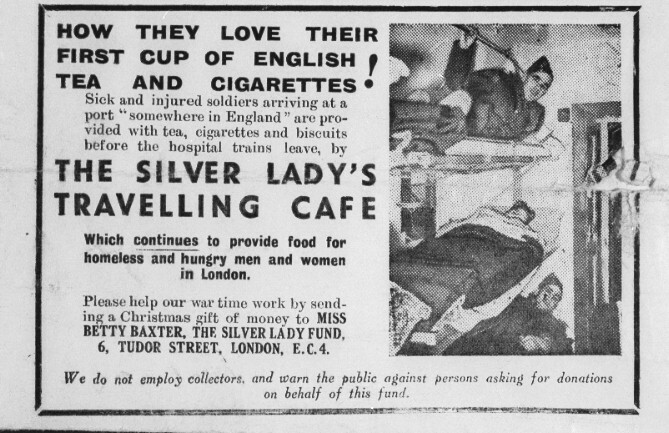 Miss Baxter’s tradition of giving a piece of silver to those in need has been preserved by the Silver Lady Fund, who continue to provide a Christmas meal for the homeless and disadvantaged, offering a gift of money as well as physical goods to those who attend. No stranger to championing difficult causes, Miss Baxter’s indomitable spirit is something the charity aims to preserve to this day. After Miss Baxter died in 1972, Mr Robert McPherson took over the Executive role and continued in this position until his death, when he was succeeded by his son Keith. In the intervening years, the Silver Lady Fund and Elizabeth Baxter Hostel continued their charitable work in London and across the southeast. However, with increasing support becoming available to the homeless in London, in 2008 the decision was made to close down the van and to re-evaluate the charity’s organisational strategy to ensure funds were targeted to benefit those most in need. As a result, the charity’s remit was expanded to enable it to support vulnerable people across the world, and in 2011 the Silver Lady Fund supported its first international project – Project Magnampy in Madagascar, bringing safe drinking water and sanitation to more than 2000 people. In 2014 the Elizabeth Baxter Hostel was merged once more with the Silver Lady Fund, bringing the charity full circle. The Silver Lady Fund now regularly supports people and projects both in the UK and internationally, and its Trustees are delighted to be able to offer increasing support to those most in need. The Fund is committed to continuing the legacy of the Baxter family through the provision of individual gifts in kind and supporting the homeless into independent living, while ensuring the charity evolves to meet changing needs across the globe. Most recently, the charity has assumed a role of facilitator for individual donors and companies looking to invest in bespoke projects that both meet the needs of the most disadvantaged, and offer the donor personal involvement with a family or community in need. Through the Silver Lady Fund’s strong partnerships and links with high quality projects, the trustees are able to offer donors a unique insight into charitable work, with clear and regular reporting to show how their money has been spent, and who has benefited from their support. For an overview of the Fund’s current organisational strategy and remit, please see How We Work.